"The GF1 performs similarly to the G1, and markedly better than the E-P1. Its autofocus system operates quickly, especially compared with the Live Mode AF of digital SLRs; unlike those models, it supports continuous AF during movie capture and is very responsive. ... The Panasonic Lumix DMC-GF1 is the first camera to truly deliver on the benefit of a mirrorless system: interchangeable lenses in a compact design without sacrificing features, speed, or photo quality at a competitive price." "After shooting with the GF1 for almost 3 weeks, I am now a believer in the M4/3 format. I was 90% there with the E-P1 and when I wrote that review, I was in love with that camera. I still love the E-P1, but after shooting the GF1 I can say that it (the GF1) really is the better camera in almost every way. With the GF1 I believe Panasonic has shown that M4/3 can be a terrific format. Small camera size, small lenses, superb color, and image quality." "The Leica DG Macro-Elmarit 45mm F2.8 ASPH is the first true macro lens for Micro Four Thirds, and sees Panasonic 'rounding off' its initial lens line to provide users with examples of all of the most popular types (standard and telephoto kit zooms, wideangle zoom, superzoom, fast normal prime and macro). In many regards it's a very appealing little lens, and its diminutive size captures the gestalt of the format perfectly. Optically it is, if not quite top of the class, still very competent indeed - and the 1:1 magnification offers intriguing creative possibilities. Indeed Panasonic G-system owners looking for an autofocus-capable macro lens can probably stop reading and buy one now - it does this job very well." "Overall, shooting with Voigtlander lenses are really fun, the camera’s compact size makes for discreet shooting, it’s styling is just fantastic and of course most importantly, I’ve found the photo quality from a m4/3 sensor is surprisingly good even at high ISOs. On the web you can hardly tell which photos were taken with my D3 and which with my tiny Olympus Pen!" "This camera can be carried with you, it's unobtrusive, quick to respond, quick to focus, has a fast lens, produces excellent image quality and has good low-light performance. There will be a viewfinder for it soon (albeit an electronic one). One can attach a multitude of older lenses, and new ones will keep being produced. It shoots great video to boot. ... Even though I have owned it for only a few weeks, I am serious when I say that as an all-around picture taker, this Panasonic GF1 may be my favorite digital camera ever." "... the Panasonic Lumix DMC-GF1 takes most of the good points of its bigger brothers, the G1 and GH1, and literally squeezes them inside a smaller, more compact-camera-like body. The fantastically well-implemented Live View, lightning fast auto-focus, excellent image quality and added bonus of 720p video make the GF1 a great camera for beginners and more serious photographers alike." "For Finn, the process of making Rejouer was aided by the camera in obvious ways (low cost to purchase and use the camera, and cheap SD cards, to name a few) and some less obvious ones, too. “I wanted to make a big movie with a little camera,” he says. “That was the concept." Read about the making of this video in the full article here. "The E-P1's anomalous blur occurs under two circumstances, both arising from the same underlying cause. (1) With the 14-42mm M.ZUIKO lens mounted, the shutter's vibration can produce sufficient vibration in the lens elements, especially at 35 and 42mm, to cause noticeable blurring from about 1/100 to 1/200 second. (2) With firmware version 1.0, and far less so with 1.1, turning on image stabilization (IS1) will result in increased blurring in about the same shutter speed range." DCResource just posted their full review of the GF1. "It's safe to say that you can't get a better endorsement than having a reviewer buying the camera they are writing about. ... It offers great photo quality, snappy performance, and all the bells and whistles that users of compact cameras are used to, with all the benefits of an interchangeable lens camera. The GF1 is the Micro Four Thirds camera that many people -- myself included -- have been waiting for, and Panasonic certainly delivered the goods." 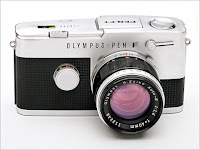 "I knew nothing of the heritage of the Olympus Pen before the E-P1’s introduction. But as I nosed into the Pen’s history I found it to be a delightfully human story of ingenuity and perseverance in a culture that simultaneously celebrated and discouraged both." PopPhoto.com just posted a review of the Olympus E-P1, which was done before the Lumix GF1 was announced. "Think big; build small. That’s the premise of the Micro Four Thirds system—big imaging performance from small cameras that have interchangeable lenses. And the first model from Olympus, the E-P1, delivers." 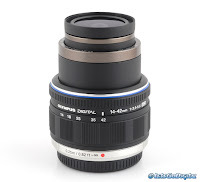 "The Olympus M.Zuiko Digital 14-42mm f/3.5-5.6 ED is relatively good match for the E-P1 but don't expect a stellar lens. The delivered resolution is pretty decent across the range although it lacks greatness towards the borders and at the long end of the zoom range. A strength of the lens is the lack of vignetting. The M.Zuiko suffers from a moderate degree of lateral CAs which doesn't seem to be corrected for whatever reason. ... A bit more problematic is the build quality of the lens - the inner lens tube is very shaky ... All-in-all a lens which has been primarily optimized for compactness and a low price tag." SLRGear just posted their review of the Lumix G 20mm f1.7 lens. "With excellent results for sharpness, resistance to chromatic aberration and essentially no distortion, Panasonic has done well with the 20mm ƒ/1.7, and we've been having fun shooting with it. For a really compact shooting package, the lens is a worthwhile investment."